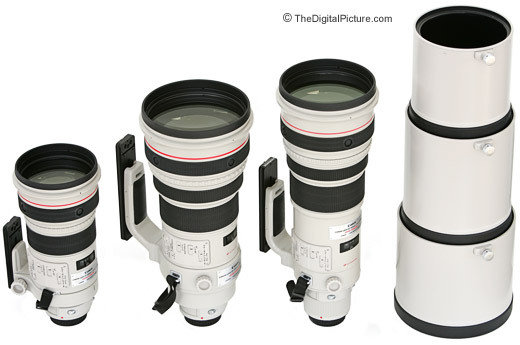 Note: The Canon EF 400mm f/2.8L IS USM Lens has been replaced by the Canon EF 400mm f/2.8L IS II USM Lens. Note that this impressive lens has been replaced by the even more impressive Canon EF 400mm f/2.8L IS II USM Lens.. 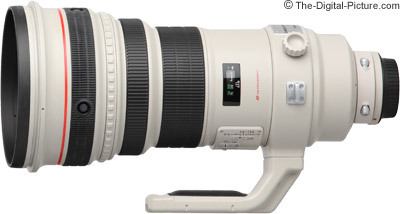 Prior, the Canon EF 400mm f/2.8L IS USM Lens was the ultimate Canon professional field/track sports lens. The 400 f/2.8 IS has many striking features, it is hard to know where to start the review. The first striking feature hits you when you put the 400 f/2.8 IS in your shopping cart - the price. At the time of this review, the 400 f/2.8 IS Lens is the third-highest-priced Canon EF lens made. This purchase will set you back a significant 4 figures. The second striking feature hits when you take the 400 f/2.8 IS out of the box. This lens is big and heavy. Weighing 11.8 lbs, the 400 f/2.8 IS is 10g heavier than the Canon EF 600mm f/4L IS USM Lens. The 400 f/2.8 IS weighs 3.3 lbs more than the Canon EF 500mm f/4L IS USM Lens and 6.2 lbs (more than twice as much) as the Canon EF 300mm f/2.8L IS USM Lens. This 400 is definitely in the heavyweight class. Add the included ET-155 lens hood for an even more impressive size. What you get for the size and money is equally as striking. Build quality that is exceptional - the 400 f/2.8 IS is at least as well built as any Canon L Lens currently produced. The 400 f/2.8 IS is definitely made to take the rigors of professional sports photography. Weather sealing protects against dust and moisture - either of which is often present in the situations this lens is well suited for. The Canon EF 400mm f/2.8L IS USM Lens' superior optical quality will not disappoint. Overall optical quality is simply excellent - color, contrast ... Distortion is negligible, CA is extremely well controlled, vignetting is minor. The Canon EF 400mm f/2.8L IS USM Lens is razor sharp corner-to-corner wide open and stopped down. There are few lenses this sharp at their wide open apertures. Sharpness in actual wide open shots is impressive - I seldom use this lens stopped down. Actually, I probably wouldn't be inconvenienced at all if the only aperture this lens had was f/2.8. Adding a Canon 1.4x Extender to the 400 f/2.8 IS yields a still-fast 560mm f/4 IS Lens with only slight sharpness and contrast degradation and some additional CA and barrel distortion added. Adding a Canon 2x Extender will result in an 800mm f/5.6 IS lens that will autofocus on all Canon EOS bodies but will result in a noticeable amount of sharpness and contrast loss. Combining 400mm telephoto compression with a fast f/2.8 aperture allows the subject to be isolated from a completely blurred background. 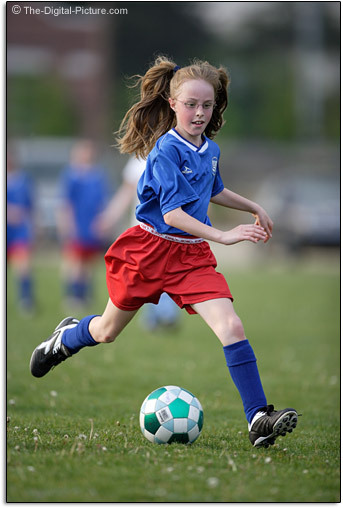 Look at the pictures in a professional sports magazine - In many shots, the background will be smooth blur of color - allowing the subject to clearly stand out. Then look at the lenses being used on the sidelines of these games - The 400 f/2.8 IS will likely be the most-used lens there. This lens is as good as lenses get for field sports (and other similar-distance-to-subject action sports) photography in this respect. Very fast and very accurate focusing is another important attribute in an action sports lens. The Canon EF 400mm f/2.8L IS USM Lens is a big winner in this respect as well. Focus acquisition occurs very fast - and quietly. AI Servo performance for action sports is excellent. This 400 has a focus hit rate as high or higher than any similar sports lens I've used. Ring USM (Ultrasonic Motor) plays a part in this performance - FTM (Full Time manual focus) is enabled. This lens includes a Focus Preset feature. Set the Focus Preset to a specific distance - when your shooting needs require that specific distance, simply turn the white knurled playback ring on the end of the lens. A 3-position focus limiter switch allows focusing distances to be limited to a specific distance range - or to be unlimited (3 to 10m, 10m to infinity, 3m to infinity). Limiting the focus distance range can improve focus lock times and reduce focus hunting. Autofocus Stop buttons near the objective lens allow autofocus to be temporarily stopped. I use AI-Servo focusing mode for shooting sports, but like to shoot a focus-and-recompose portrait at times during the event. The Autofocus Stop feature makes it easy to obtain focus lock, turn off autofocus and recompose for a framing that places the focus point off of the subject. As you can derive from the focus limiter switch numbers, the 400 f/2.8 IS has a relatively long minimum focus distance of 9.8' (3m). This focal length at this distance yields a not-too-exciting .15x maximum magnification. An extension tube can help this issue, but maximum magnification is extended to only .19x and .23x with 12mm and 25mm extension tubes respectively. Image stabilization (IS) is another excellent feature in the 400 f/2.8 IS L. Although not as important for stopping action in a sporting event (I turn it off for sports), IS is excellent for many other situations the 400 f/2.8 might be useful for - such as wildlife photography. Wildlife tends to be most active in the low-light hours of the day. The 400 f/2.8 IS's wide aperture, long focal length and IS make it an excellent wildlife lens. The IS version installed in this lens is tripod-sensing. This lens knows that a tripod is being used when vibrations go below a certain level. Keep IS turned on when mounting this 400 on a tripod to take advantage of this secondary IS mode - reducing mirror slap, shutter and tripod vibrations. Mode 1 and 2 (panning mode - 1 axis of stabilization only) stabilization are included. Even though it has IS, do not expect to carry the 400 f/2.8 IS around your neck and shoot it handheld as you wish. Unless you are much stronger than most of us, you will find it too heavy for this type of use. You will likely want to carry this lens in a backpack or over your should while attached to a sturdy monopod or tripod. When in use, some form of support is generally desired. Sports photographers often employ monopods, wildlife photographers usually prefer tripods. Even though a good tripod head such as the Arca-Swiss Z1 is rated to hold far more weight than the 12 lb 400 f/2.8 IS, lens flop is a situation that can easily occur. When adjusting the tripod head, a heavy lens can quickly fall forward - which then can topple the tripod - resulting in an expensive repair. I highly recommend using the superb Wimberley Tripod Head II with this lens. When properly attached to the Wimberley Head, the 400 f/2.8 IS can be positioned using only two fingers. This head makes using a lens of this size/weight a simple endeavor. I am using a Wimberley P50 Lens Plate on this lens, though replacement tripod ring feet are available and preferred by some. Aren't they beautiful?! Pictured above from left to right are the Canon EF 300mm f/2.8 IS L USM Lens, Canon EF 400mm f/2.8 IS L USM Lens and Canon EF 500mm f/4 IS L USM Lens. Stacked on the right side from top down are the lens hoods from the 300, 500 and 400. All lenses are pictured with optional Wimberley Lens Plates. 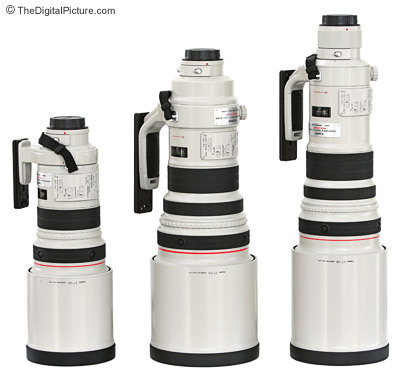 Pictured above from left to right is the Canon EF 300mm f/2.8 IS L USM Lens, Canon EF 400mm f/2.8 IS L USM Lens and Canon EF 500mm f/4 IS L USM Lens. Like most of Canon's other super telephoto lenses, the 400 f/2.8 IS comes in a nice Canon hard lens case/trunk (overpriced at $500 or so if required to be purchased separately - unscrupulous retailers may omit this feature). The Canon Lens Case 400 (about 11" x 12" x 23" / 25.74mm x 28.08mm x 53.82mm) is slightly larger than the Canon Lens Case 500. This case should be small enough to qualify for a carry-on with most airlines - check with your specific airline before you leave home. Also included is a neck strap and leather-like lens cap. Also like most of Canon's super telephoto lenses, the 400 f/2.8 IS utilizes 52mm drop-in filters. Included is a drop-in gel filter holder with a glass filter installed. This glass filter is also a nice way to catch dust before it drops deep inside the lens. A Canon 52mm Drop In Circular Polarizer Filter is available. A protective objective lens element can be replaced relatively inexpensively should something unfortunate happen. If 300mm is enough focal length for you, I recommend you purchase the Canon EF 300mm f/2.8L IS Lens. It performs similarly optically and physically but weighs and costs much less. It does not create as much background blur though. If wildlife (including small subjects such as birds) is your subject, consider the Canon EF 500mm f/4L IS Lens as well. Although you loose 1 f-stop, the 500mm f/4 IS L costs significantly less and is easier to take with you. If you need more than 300mm of focal length and need an f/2.8 aperture to stop action in low light, the Canon EF 400mm f/2.8L IS USM Lens is the perfect lens. Track and field, soccer, football, baseball, racing ... or anything else requiring a fast 400mm lens. The 400 f/2.8 IS L is simply an excellent sports and wildlife lens.